Our brand new story series for you little ‘uns. 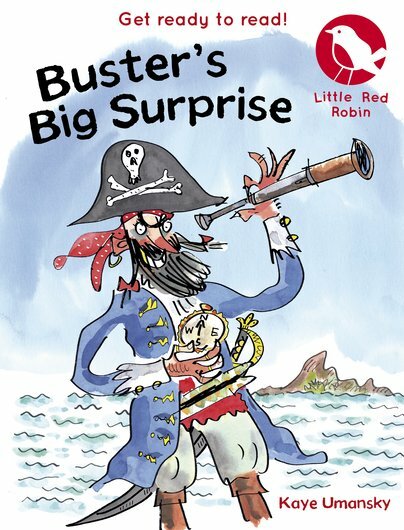 The funniest fiction to shiver your timbers! Little Red Robin is our new way to get small people like you reading. Colour pics, funny stories, top authors like Holly Webb and Kaye Umansky. We’ve made these books all-round great! They help you get beyond picture books and onto longer fiction. And they do it in the funniest way. Get your first taste in this story about a big, bad pirate. Boat chases, ship’s biscuits and peril on Allspice Island. Read an extract from Buster’s Big Surprise. Boat chases, ship’s biscuits and peril on Allspice Island. Kaye Umansky has written over 100 books for children, and is best known for the Pongwiffy series. Kaye won the Nottingham Children’s Book Award for Pongwiffy and the Spell of the Year in 1993.